This is the original art from page 5 of Daredevil Dark Knights issue #5. 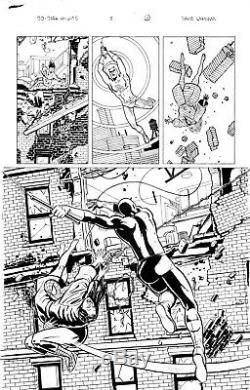 A DD story written and drawn by David Lapham and featuring Daredevil and Spider-Man. Pencil and Ink on 11x17 Bristol board. I work for David Lapham and can have the artwork signed and or personalized on request. The item "DAREDEVIL Dark Knights #5 page 5 Original Art by David Lapham" is in sale since Sunday, June 17, 2018. This item is in the category "Collectibles\Comics\Original Comic Art\Interior Pages". The seller is "zisette" and is located in Pasadena, California. This item can be shipped worldwide.